Combine ancho chile powder, oregano, chipotle chile powder, cumin, 1 teaspoon sugar, salt and ground peppers in a medium-sized mixing bowl; add beef and toss to coat on all sides. Heat 2 tablespoons of oil over medium-high heat in a large, non-stick skillet until hot. Add half of beef and brown on all sides; remove from pan to bowl and repeat with remaining beef. Add remaining tablespoon of oil to skillet; stir in onion, carrot and garlic and sauté until onion is tender. Stir in pasilla chile, bay leaf and cloves. Spread onion mixture evenly over bottom of a 4-quart ovenproof covered casserole sprayed with non-stick vegetable cooking spray. Pour beef cubes over the vegetable mixture. Blend flour and remaining ½ teaspoon sugar; stir in beef broth and mix well. Pour broth mixture and beer over beef. Cover casserole and bake in 325°F oven 2 to 2-1/2 hours, or until beef is tender. Remove beef and shred with two forks; return to mixture in casserole and mix together. Preheat oven to 350°F. Leave the foil covering in place and bake until hot, about 30 minutes. 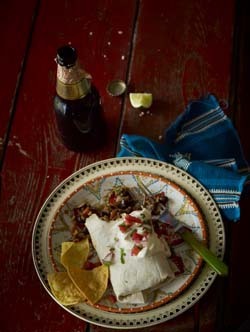 Top burritos with sour cream and any remaining sauce before serving. SERVING TIP: Burritos may be topped with purchased enchilada sauce before baking.